Last spring (2002) our 7 year old Bernese Mt. Dog, Jubilee, became ill. She was going down hill very fast. She was not eating or even drinking for over a week. We were giving her fluids manually. We offered her every kind of food we could think of, including all of her favorite treats. The only thing we could get her to eat with any consistency was your cookies (sometimes dunked in milk). We believe they helped get her through this hard time until she was strong enough for surgery. “Thank you” for making a dog food product that good! 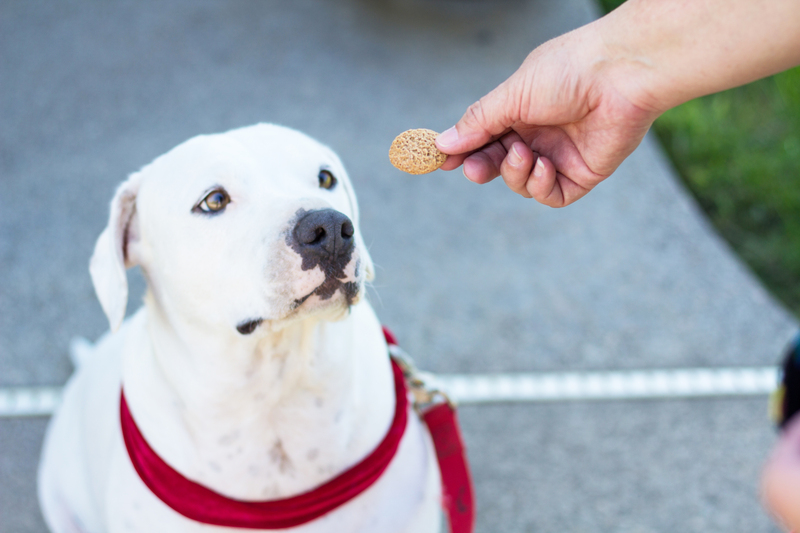 The Animal Cookie Company Dog Cookies are a wonderful treat for any dog! It’s nice to know that what I’m offering my dog and my clients is wholesome and healthy and I don’t need to worry about by-products, sugar, corn or wheat. And the greatest thing is that I can eat them, too! The Animal Cookie Company bakes their cookies as if they were being made for the finest restaurant, so you can be assured they’re fresh and baked with love of animals in mind … instead of just to make a “buck”. The only ingredient that is not listed on the package is “integrity”. Go out and buy some! You’ll find out what “real” tastes like! Just wanted to drop a quick note to let you know that our dogs love your Sweet Potato Cookies! They are finicky when it comes to food, usually only meat based dog food, so it is nice to give them something they love that is also good for them. We’ve attached a few pictures. Thanks again! I just wanted to take a moment to reach back to you on your product, The Animal Cookie Company cookies. I am opening a dog store this summer and have been trying to find a quality, healthy all around good cookie that my customers are able to give day in and day out to reward their best friends. After getting samples from various other companies in the cookie/biscuit community, all of my 20 or so cookie tester dogs never put their noses up to The Animal Cookie Company! After trying to find the right biscuit for my customers to buy at bulk, I was very happy to have found the right one, The Animal Cookie Company. Your company can rest assure that all your cookies are making friends here in Montana! Thanks so much for delivering the dog cookies. I wish you could have seen BJ’s face. I think he died and went to cookie heaven. GREAT Cookies! We have a 4.5 lb Papillon who, as with many small dogs, has finicky taste. I buy her dog treats constantly, but the usual scenario is that she will eat one treat, if I’m lucky, and no more. An entire box or bag once again goes to our 70 lb Husky who would eat the box or bag “empty”. On a recent trip to Carmel we stayed with our dogs at Cypress Inn. The cookies you provide the hotel are not only Papillon size, but she loved them! The husky was never given the opportunity for a taste test. We were given a total of six and the Papillon enjoyed them all. One of the best parts of the trip was discovering your great product. Thanks. We have two dogs: Copper, a small 1year-old, and Meeko, Both are mixes we picked up from the pound as a puppies. Copper has to be one of the pickiest eaters I think I have ever met. We have had to go through various foods and biscuits for her until we found ones that she would actually eat, to the point of making foods and treats ourselves. Much to our amazement and happiness, she *loves* your carrot cookies. The first time we gave her one, she ate it immediately and we knew we had found a winner. Now, both she and Meeko eagerly look forward to your snacks. Congratulations on making such a wonderful product! Hi! Just had a sample of your vegetarian dog cookies from the Cypress Inn. A friend spent Christmas there. My dogs went nuts with the treats.